In July 2013, a Maine lawyer was seriously mauled by a polar bear while on a Sierra Club-sponsored adventure trip to Labrador with six other hikers. He lived to tell the tale to an eco-journalist, who has turned this terrifying incident into an ebook with an alarming message of imminent polar bear extinction that has already lost what little scientific credibility it once had. I have little doubt the man mauled by the bear was indeed terrified and that his companions were as well. However, that horror is exploited shamelessly in this book as a means to promote anxiety over the future survival of polar bears and instill panic over a prophesied Arctic “meltdown.” It uses the gruesome details of a predatory polar bear attack—a known media and publishing draw—as bait to sell a false message that Arctic sea ice is in an unnatural state of decline and polar bears are in peril. Not only did the attack itself have nothing to do with a starving bear but the population to which the bear belonged has been increasing in size despite sea ice declines. As for the “peril” of polar bear extinction emphasized in the book, models used to predict such a dismal future have been declared unscientific by top conservation experts. The polar bear attack took place in Torngat Mountains National Park in northern Labrador, which can hardly be described as “the top of the world” (see map). The date of the attack was 24 July 2013. According to Canadian Ice Service charts, sea ice had left the coast in late June or so, as it had for the last few years. This means that by July 24, polar bears had been onshore for only a few weeks. If anything, the attacking bear may have been so fresh off the ice that he was still in hunting mode, ready to keep eating. Most polar bears are at their heaviest weight of the year in early summer. The subpopulation of polar bears to which the attacking bear belonged is known as “Davis Strait” and its bears have been variously described as “stable” (by the International Union for Conservation of Nature Polar Bear Specialist Group in February 2014) and “likely increasing” (by Environment Canada’s Polar Bear Technical Committee, in June 2014). Overall, Davis Strait bears off Labrador experience an ice-free season from late summer to fall that is usually longer than that of western and southern Hudson Bay bears. Although the exact dates are variable, southern Davis Strait bears are generally onshore from about mid-to-late June to early or late December. The Davis Strait polar bear population has grown substantially since the 1990s despite a slightly longer ice-free season. 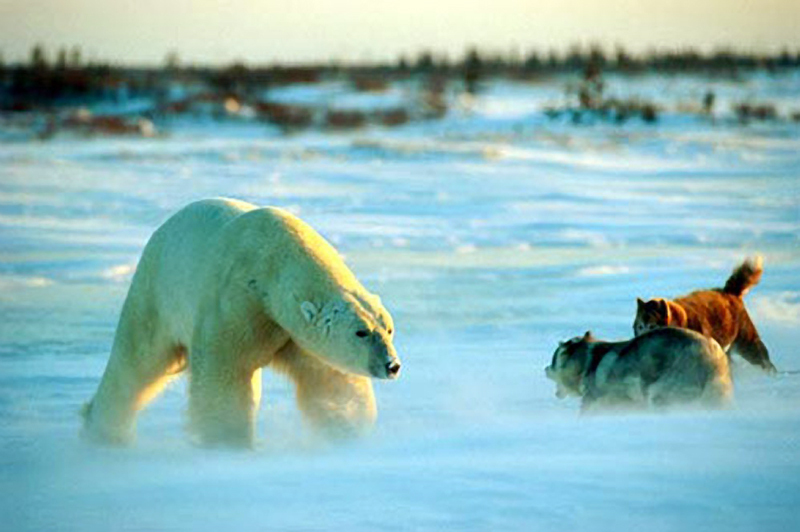 Polar bears off Labrador eat primarily harp seals in the spring (the most important feeding season). Labrador-area bears are doing very well because harp seal numbers are currently at their highest since the mid-19th century. Seven hikers, two of whom were the expedition’s Sierra Club leaders and another was a board member for the book’s eventual publisher, set out on a two-week-long adventure. The victim was Maine lawyer Matt Dyer, a self-described “liberal activist” and long-time Sierra Club member. Dyer suffered two broken neck vertebrae, a crushed jaw and broken bones in his left hand. One of the other hikers, an MD, was able to stabilize Dyer’s injuries until he could be airlifted to Montreal for more extensive treatment. He eventually recovered. Dyer’s polar bear attack story has been shamelessly exploited by Shankman as an attention-grabbing vehicle for fearmongering about sea ice declines and polar bear extinction blamed on global warming. However, the computer models created by IUCN Polar Bear Specialist Group biologist Steven Amstrup and his colleagues, used to predict possible polar bear extinction by 2050, has been strongly criticized by IUCN Red List modeling experts as unacceptably unscientific. Take away those deficient models and the hype over imminent extinction evaporates against a wall of evidence that polar bears have so far not been harmed by the dramatic summer sea ice declines documented so far (see “Polar Bears Miss the Message on Global Warming” at www.rangemagazine.com. Click on Fall 2014). The polar bear is not “losing its natural habitat to a manmade meltdown”– neither is it “battling starvation” or “facing extinction.” Such blatant misinformation distracts from the take-home message that should have been the focus of this book: hikers who travel unprepared in polar bear territory put their lives at risk. This entry was posted in Polar bear attacks and tagged book review, InsideClimateNews, Labrador, Meltdown, polar bear attack, Shankman, Torngat Mountains. Bookmark the permalink.